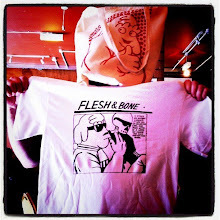 Another Flesh & Bone 2.0 from my bulging sack of digital spanners. Normal analogue service will be resumed after Christmas, tomorrow's and the big day's are likely to be as crude - I'm distant from my scanner see so I'm pumping them out direct to the screen for now. Currently listening to : Bob Dylan "Forever Young"